It is an exciting month ahead at Pallant House Gallery in Chichester this October as we see the opening of three exhibitions focusing on the work of outsider artists, or those who face barriers to the mainstream art world. The triennial competition, Outside In: National, will showcase works by selected finalists who submitted their work the competition earlier this year. Accompanying this ground-breaking exhibition will be a chance to see the fascinatingly diverse work of Pat Douthwaite and (for the first time in the UK in almost 50 years!) 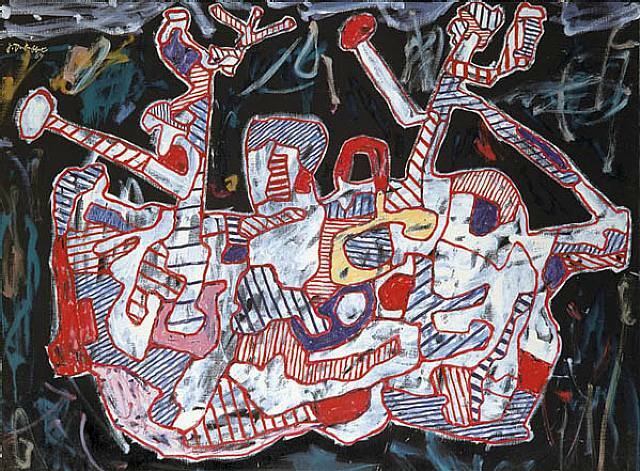 a major review of the work of Jean Dubuffet: father of Art Brut. Despite an introduction to painting by J. D. Fergusson, whose wife Douthwaite had studied mime and modern dance with, Douthwaite was for the most part a self-taught artist. Because of this, she is often associated with Outsider Art in spite of her regular exhibition schedule. She was controversially not interested in establishing a place within the cultural mainstream and was always comfortable being linked to the term Outsider Art; her early work was even influenced by pioneer of Art Brut, Jean Dubuffet. Douthwaite lived a predominantly disorderly lifestyle; a lifestyle that involved a lot of travel and a lack of a permanent base or studio from which to work. Douthwaite worked in a variety of media including collage and assemblage, making her work as colourful as her semi-nomadic life. Transitions will be the first major review of Dubuffet’s work for almost 50 years in a UK institution. Organised with the assistance of the Fondation Dubuffet in Paris, the exhibition will feature key paintings, drawings and sculpture from collections across France and the UK. Born in Le Havre in 1901, Dubuffet ran his father’s wine business for 17 years before returning to painting in his distinctively simple, primitive style. Dubuffet himself was fascinated by the work of children and the insane, eventually leading him to coin the term Art Brut in 1945, which translates as ‘Raw Art’. In 1949, Dubuffet produced a manifesto entitled Art Brut in Preference to the Cultural Arts, in which he intended to ‘valorise the idiosyncratic creative works of individuals which he considered to be outside “the system”,’ but to also ‘directly challenge and undermine the authority of “high culture” and conventional definitions of art.’ [Karen Jones et al., Framing Marginalised Art, 2010, p 11].